Recombinant monoclonal antibody to EGFR. Manufactured using AbAb’s Recombinant Platform with variable regions (i.e. specificity) from the hybridoma 7A7. 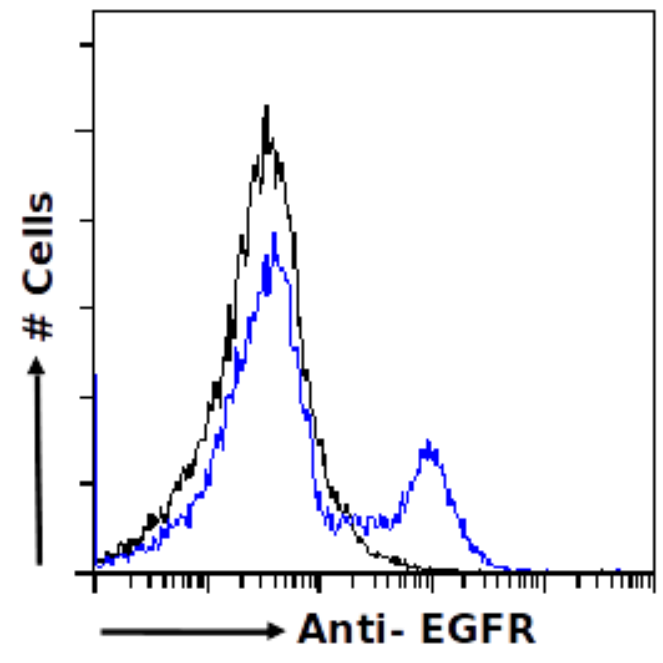 Immunogen: Recombinant extracellular domain of murine EGFR (rECD-mEGFR). Specificity: Recognizes the extracellular domain of EGFR. Note on publication: Describes the generation and characterization of an anti-murine EGFR extracellular domain monoclonal antibody (7A7 MAb) (IgG1). Flow-cytometry using the anti-EGFR antibody 7A7 (Ab00134) A431 cells were fixed using 2% PFA, permeabilised using 0.5% Triton and stained with unimmunized rabbit IgG antibody (MOPC-21; isotype control, black line) or the rabbit IgG-chimeric version of 7A7 (Ab00134-23.0, blue line) at a dilution of 1:100 for 1h at RT. After washing, bound antibody was detected using a goat anti-rabbit IgG AlexaFluor® 488 antibody at a dilution of 1:1000 and cells analyzed using a FACSCanto flow-cytometer. 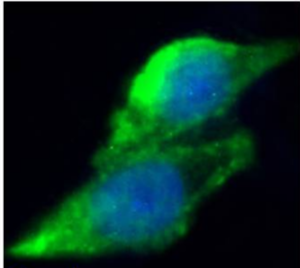 Immunofluorescence staining of fixed A431 cells with anti-EGFR antibody 7A7 (Ab00134) Immunofluorescence analysis of paraformaldehyde fixed A431 cells permeabilized with 0.15% Triton and stained with the chimeric mouse IgG1 version of 7A7 (Ab00134-23.0) at 10 µg/ml for 1h followed by Alexa Fluor® 488 secondary antibody (2 µg/ml), showing membrane staining. The nuclear stain is DAPI (blue). 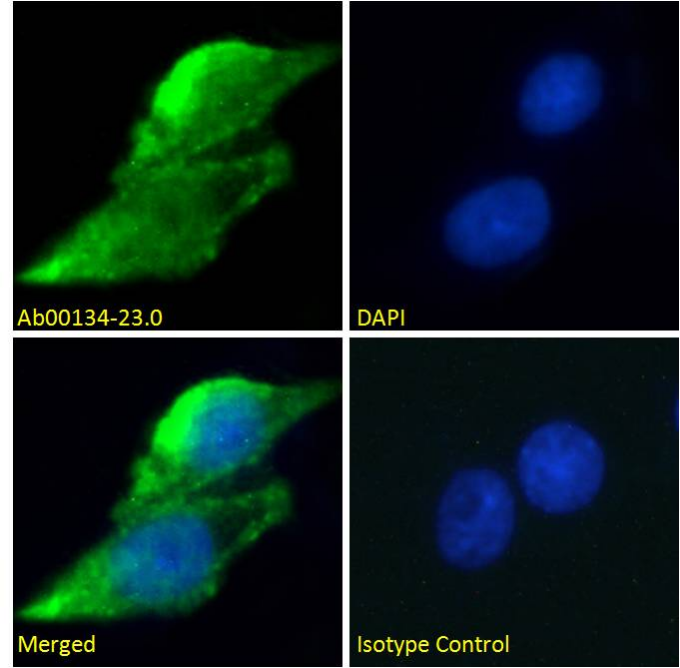 Panels show from left-right, top-bottom Ab00134-23.0, DAPI, merged channels and an isotype control. The isotype control was stained with an anti-unknown specificity antibody (Ab178-23.0) followed by Alexa Fluor® 488 secondary antibody.